Our Savior Parish and USC Caruso Catholic Center is a home for Trojans of all ages who wish to learn and live out their Catholic faith. As one of the top five collegiate Catholic centers in the nation, we provide the Catholic Trojan Family with dynamic programming that encourages community and faith building. Stop by or get in touch to learn more about all we have to offer at Our Savior Parish and USC Caruso Catholic Center. Fight On & Pray On! We are a diverse community made up of over 10,000 current USC students as well as alumni, parents, and friends of USC—we call this the Catholic Trojan Family. Throughout the school year, the USC Caruso Catholic Center offers our Catholic Trojan Family a variety of service, spirit, and intellect opportunities to participate in. You’ll become tightly integrated in our family as you participate in social justice initiatives, worship together at any of our eight weekday and Sunday masses, attend engaging lectures, or simply break bread together at our weekly community dinner on Sundays. Since our humble beginning in 1923 when just 62 USC students gathered together to form the Newman Club on campus, the Catholic tradition at USC has grown with the university itself. Generations of students have attended Mass here, graduated, and made our Catholic alumni network stronger than ever. Today the USC Caruso Catholic Center is one of the largest communities of Catholic students west of the Mississippi. The opening of our all-new Our Savior Church and USC Caruso Catholic Center in 2012 marked a new chapter in our long history. Through the tremendous support of our growing and dedicated Catholic Trojan community, we became what and who we are today. Our Savior Parish and USC Caruso Catholic Center embraces the University of Southern California’s mission of “the cultivation and enrichment of the human mind and spirit.” We realize this mission by worshipping in communion with the Roman Catholic Church, fostering fellowship, promoting social justice, and nurturing the spiritual life of students, alumni, faculty, staff, and members of the local community. 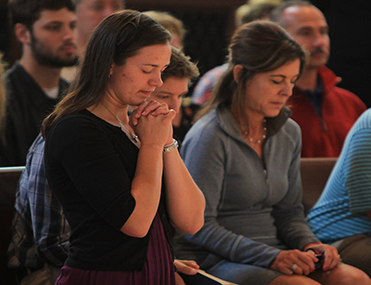 Through these means, we seek to develop transformative Catholic leaders bearing witness to the Gospel of Jesus Christ.